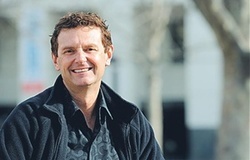 Construction has commenced to bring the NBN to hundreds of households in the Belconnen area, Member for Fraser, Andrew Leigh said today. Andrew Leigh today welcomed the release of detailed maps by NBN Co, showing where construction of the National Broadband Network (NBN) will start in Aranda, Belconnen and parts of Macquarie and Cook. “The map shows that NBN fibre is being rolled out in Belconnen which will allow more residents access to faster, affordable and more reliable broadband. Getting Aranda in early will no doubt save a pretty penny in correspondence. And what happened to Nicholls? The forgotten Gungahlin suburb with no ADSL2. Really? Two friends of mine live in Nicholls, both off Temperly Street at the Curran Drive end and they both have ADSL2, one with DODO and the other Bigpond. Now must admit I thought all of Nicholls was on a RIM, so ADSL2 with Bigpond only (Telstra must resell ADSL1, max speed on a RIM of 2meg but not ADSL2) but the other guys is with Dodo and also gets ADSL2 speeds. 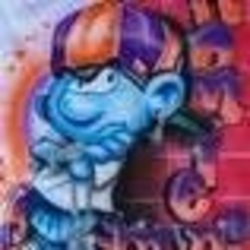 I live in Dunlop, also on a RIM, used to be with iiNET on ADSL1 max speed 2meg, changed to Bigpond and now get 8meg. And every time I try to enter my address at the NBN site to see when we will be connected, the iPad swoons and quits. Some would call this irony, but perhaps it illustrates the need for the NBN. Or perhaps it is something to do with iPads. Our part of Casey didn’t get NBN yet. We do have fibre to the home. Not sure if that’s worse, but I am not very happy about the limited choice of ISPs compared to NBN. That’s what BBQNinja explained in post#8. Fibre to the home is essentially the same infrastructure as what the NBN is, it just happens to be owned by TransACT. This is why your internet is currently only offered by a limited number of ISP’s which TransACT allows to use it’s infrastructure. NBN Co is in the process of buying this infrastructure from TransACT, at which point I would imagine it will be opened up to all the ISP’s that will be offering the NBN to other people around Canberra and you can signup with one of them. Until the sale goes through however, you are stuck in the same situation you currently are being gouged by the monopoly that TransACT has in suburbs like Casey & Crace. Southside anyone? You can all moan and complain but most of the Southside isn’t even getting a whiff of it for another 3 years. Not quite true. Farrer, Greenway, Isaacs, Kambah, Mawson, O’malley, Oxley, Pearce, Torrens, Wanniassa are scheduled to start in July. albeit this will be a parcel of work and will start in one suburb and work its way through those suburbs. Rest of Tuggeranong due to start in May next year and South Canberra in December, with Weston Creek and Northen Woden following in 2015. There are always going to be people who can get it first. Even under the coalition plan, some people will get it first and others will get good speeds and others will not. At least the NBN is fairly equal when it comes to service standards. So probably 2.5-3 years for those in the suburbs of Chapman, Chifley, Curtin, Deakin, Duffy, Fisher, Garran, Holder, Hughes, Lyons, Phillip, Rivett, Stirling, Waramanga, Weston, Yarralumla, although the new apartments in Lyon should have it installed. Thats the worst case for Canberra. Assuming the contracts are locked in, and the rollout has progressed too far for the coalition to stuff it up. funny thing is the polls generally show this is the only policy labor has that is popular among all voters. If the Coalition embraced this policy and put political spin on managing financially better, Labor would probably lose even more seats at the next election. Have you looked at the maps Chop? They ARE delivering it – in spades. I would’ve thought those areas would be pretty well serviced already by ADSL2+ from the Belconnen exchange. Surely the people out in the new suburbs of West Belconnen on RIMs miles from the exchange should get it first. The initial choice to start in Gungahlin as a Stage 2 Pilot Site was driven by need, as a result of many years of lobbying by people both before and during my time with GCC. But since they started, it has been entirely logistics of the engineering that has driven their roll-out – not whether any suburb is more “deserving” than others. Just be satisfied that – irrespective of the election outcome – most of Canberra will be locked into contracts. It’s just a crying shame that other parts of Australia will probably miss out, and instead be saddled with a “solution” that was reported just yesterday will probably max out in just four years. how about concentrate on getting all of Gungahlin area NBN first? The build is already done in Franklin. So you can either get it now by just calling your chosen ISP and asking them, or you’re in the northern part of Franklin that has had fibre built-in from day 1 and available via Transact. You need to understand how a project of this magnitude is managed and how the fibre rollout is actually implemented. Most of gungahlin is now done and they are connecting up the residential premises as we speak. this work will be laying the fibre through the pits and ducts etc and it was announced shortly after gungahlin. There are 2 Points of interconnect for Canberra region, one in Queanbeyan which has also started work. Generally work will spread outwards from these points, but Gungahlin was a special case that needed attention first. 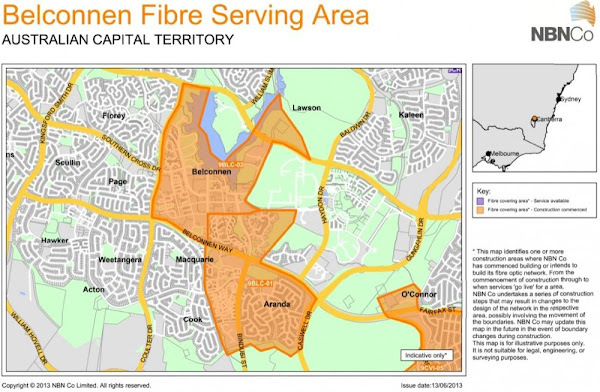 Hopefully Canberra will just complete as a FTTP rollout post september 2013 as alot of work will have started and to stop will be a pain in the neck. Because starting work in other areas of Canberra doesn’t affect the work being done in Gungahlin at all? There are several phases of work that need to be done to build the NBN, and the work at the beginning doesn’t affect installation in Gungahlin at all. Depending on where abouts in Franklin you are, you may also be on the TransACT fibre network. If you are, then your connection is only delayed by legal stuff around the NBN buying the network off TransACT. That’s not how the NBN works. The crace exchange does not “have the NBN”. The NBN works off of a different architecture than ADSL. You won’t connect back through crace most likely with the NBN, you’ll locally connect to a FAN (Fiber Access Node) which serves 64 or 128 people (I’m not sure off the top of my head). That FAN will connect back to a FDH to an aggregation node. That’s bascially an exchange, which then points back to the POI for the region, but won’t necessarily be in the same place as your excahnge is now. You can see that there’s a lot of “hops” between you and the “central point”. And what “fibre optics” are available in your suburb? From that I’d assume that you’re in Casey stage 1, as stages 2 and 3 have transact FTTH? If so, the delay is likely the purchasing of Transact’s FTTH. You’ll connect through the rest of casey, and that can’t happen while NBN doesn’t own it. West Belconnen is a different Fiber Servicing Area to Belconnen. West Belconnen is part of the Scullin FSA, and it’s due to start in August. This announcement today is which areas in the Belconnen FSA will begin construction first, and come August there’ll be a similar announcement for which areas of the Scullin will start first. So West Belconnen may still be not that far off. Also, is this roll out in spite of the announcement that NBN work has been halted in Canberra? That announcement was pretty misleading. ‘The NBN’ was never halted – there’s a whole lot of design and planning work, and connections to houses, that have zero issues with asbestos. The only work that was halted was Telstra doing work on the pits that the NBN are going to use when they connect up suburbs. It could definitely have an impact on timelines, but there’s a stack of work that NBNco have to do before any fibre is laid in the ground. so is this going to over build the TransACT network in these suburbs? It’ll overbuild the TransACT VDSL network. The TransACT Fibre network (which only ever went to the new suburbs in Gungahlin) will be bought by the NBN and they’ll operate them, so no overbuilding there. I’m not sure, but I don’t think the roll out has ever been focused on who needs it more or ‘should get it first’. Agree. Wasn’t Aranda also the first place to get TransACT?